Given that my first two posts went from serious to worse you might think that I’ve never seen love. You would be mistaken. And that’s always been part of the problem. I’ve rarely seen it as clearly as I saw it in the lives and actions of my grandparents. Let me introduce you to my paternal grandfather, Herman Eslinger. 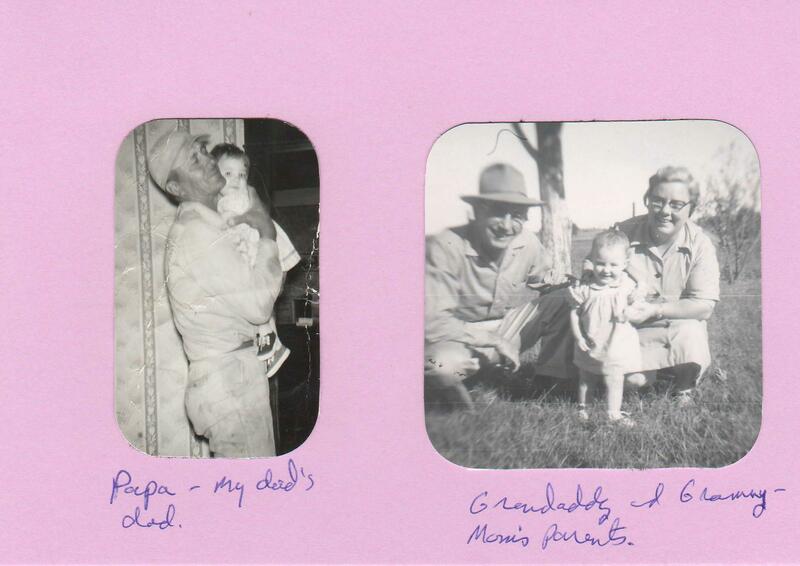 We called him Papa – pronounced Pawpaw, because that’s just how we said it. He was a big man, 6 foot and 7 inches tall, with the largest hands I’ve ever seen. Babies were perfectly safe when he held them one handed. I remember him carefully dangling a cherry Lifesaver into my baby sister’s drooling mouth by the red waxed string that he pulled from the candy roll so that she could enjoy a treat along with the rest of us. He would let my brother help by “driving” the tractor on the back forty and would sneakily steer him away from the fences and the pond. He taught me to look for arrowheads after a rain when the fields were freshly plowed. His one and only wife passed away before I was born, and so far as I know he loved her until the day he died. They were unable to have children, and had adopted my dad and his sister. He doted on his grand-kids, and even after dad stopped visiting he made an effort to remain in our lives. And here are my maternal grandparents, Iva and John Thomas. They were my Granny and Granddaddy. He painted houses – from ladders, not on canvas – and she sewed clothing for people to add to the family bank account. He adored her and she him. They took me to plays and cultural events. I saw “The King and I” on stage and watched the Harlem Globetrotters baffle another basketball team thanks to them. Granddaddy was 6 foot tall and thin while Granny was only 4 foot 10 and a little round. They sat side by side in the evenings with only a side table between them to hold his reading lamp and her sewing kit. I often saw them holding hands under that table while they watched Cardinals games on TV. Once I caught a look between them that told me there was still fire and even passion between them, too. How embarrassing! I can see the love in these beautiful faces. I was a lucky kid! The story I want to share happened around my 12th or 13th birthday when I was staying with Granny and Granddaddy. Papa came to visit, and I made the egregious faux pas of inviting him into their house…into enemy territory. Instantly I knew that I had done something horribly wrong. And just as instantly I saw those three good and honorable people, who all loved me, silently agree to an unplanned detente. They cordially ushered him in, he graciously accepted, and everyone behaved pleasantly to each other for an entire evening on my behalf. I don’t need to know anything else about love.